Though the Hash House Harriers may dress a little eccentrically and run around the city following trails of flour, they are not terrorists. I know. I’m one of them. So when I got the call Tuesday morning from my editor to start the day investigating the evacuation of the Lincoln Park Zoo– prompted by the discovery of a mysterious white substance–I had a sinking feeling that instead of reporting on a story, I might become part of it. 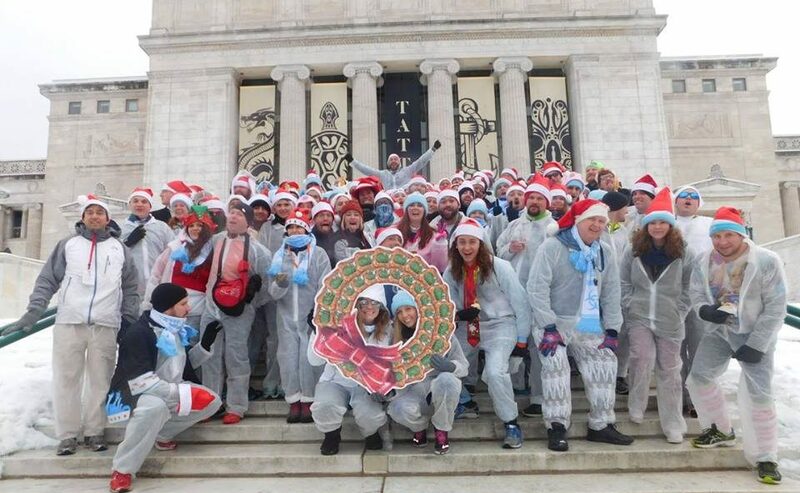 “It’s probably the Hashers,” said my wife, Dawn Klingensmith, referring to the running club we had joined a year ago. Our concern grew after a call to the “grandmaster” of the running club, Mike Bendas. He confirmed they had run next to the zoo Sunday and had used flour to mark part of the trail. You see, the Harriers is a group that plays a version of “hounds and hares,” a game where a designated “hare” lays a trail and others try to follow it. Started by the British in Malaysia during the late 1930s, there are 1,500 chapters running in every major city in the world. In Chicago, they mostly use chalk to mark the trails. But when the trail runs over grass or dirt (and it frequently does), it is marked with white flour. My wife and I had run with the club in many neighborhoods, including Lincoln Park. Though we didn’t make this run, we knew it was possible that the unknown substance causing the alert could be “hash” marks. When I arrived at the park, it was, well, a zoo. Police and fire emergency vehicles were flashing lights everywhere and firefighters were breaking out hazmat suits. Cops wouldn’t let anyone east of Clark Street. This was all triggered after a zoo employee found one of the piles of powder outside the zoo that morning. Though reporters aren’t supposed to get personally involved in a story, after talking with Bendas, we decided the cops needed to know what we knew. Approaching Cmdr. Michael Chasen, I told him the story and he had another officer interview Bendas over the phone. He put police in touch with two other hashers who actually ran the trail. One hasher, at O’Hare Airport waiting for a flight, marked the trail on a detailed map printed out on a police computer at the airport. The other was picked up by detectives; he gave them a personal tour of the route. When the accounts of these two sober citizens matched, authorities concluded it was indeed flour. Bendas said that at the height of the anthrax scare a year ago, the club notified police in advance of using flour, but had trouble finding someone in authority to listen. “We would love to have an official point of contact in the future,” he said.